Just outside of Kapalua, Maui on the peninsula between Oneloa Bay and Honokahua Bay is an area known as “Dragon’s Teeth.” So named for the area’s jagged rocks that line the coast and cliffs, this point has several interesting features. One of most well-known features is the nearby Nakalele Blowhole. Another is are the sharp, gray, rock formations that jut high into the air, being described by visitors as awesome, bizarre, and inspiring. Yet another is pictured here: a labyrinth made of stone on the grassy plain. 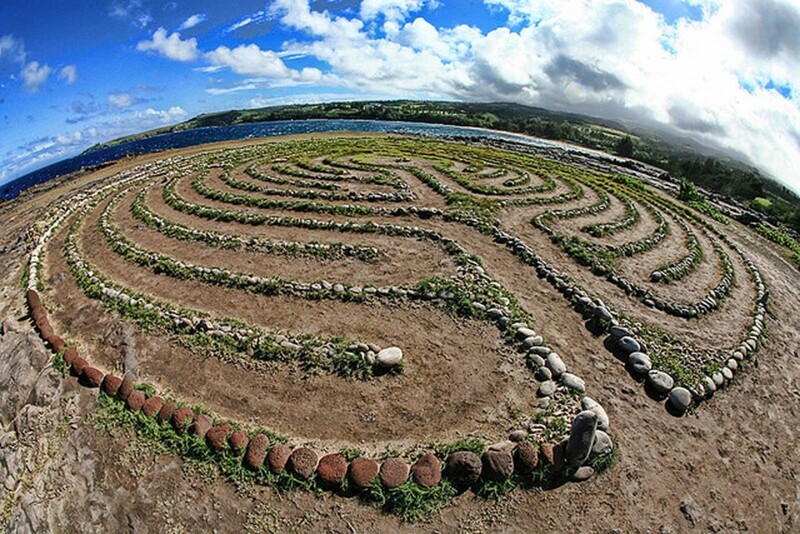 Found this maze out on a lava tongue leading to the Dragon’s Teeth behind the Kapalua golf course. Makalua-puna Point was created from one of the last lava flows on Maui. However, the lava here is a little different from the rest of the lava on Maui – it is much lighter, denser, and fine-grained. The wind sweeping over the point caused the lava to harden in an upward fashion. The jagged points of this formation look like dragon’s teeth, thus the name. Although we are not sure of its exact purpose, the layout follows that of a prayer labyrinth. Prayer labyrinths have been around for at least 3,500 years and have been created and used for by many cultures for a wide range of religions. This maze at Dragon’s Teeth is new in the last 30 to 60 years.